Picked clients up at the dock at 6:30 and started the search for bait. Looked deep for Gizzards for 40 minutes but with the front passing through the bait had moved so we went shallow to find them. After throwing for 3 1/2 hours we put out planner boards rigged with big Gizz and ran flats on or near main lake points. We hit 2 or 3 points and flats before we found one with fish that wanted to feed and started getting hits on every pass. The Stripers were moving up on it to feed and pulling right back off of it. We ran the same flat for 4 hours . 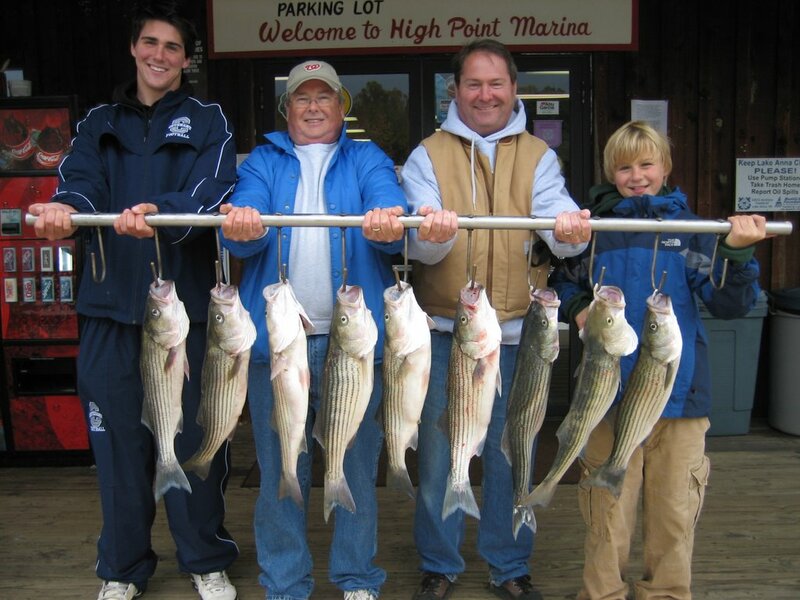 The Stripers were all about the same size [5 to 6 pounds] and would hit our offerings about once every 15 minutes. Matt and his sons had a great day and enjoyed fishing on the lake that they are helping to develop[Matt is developing the new community "Cutalong"at the intersection of Routes 208 and 652]. We had 17 hits today and boated 10 Stripers. Looks like the fish are starting the fall feeding blitz and fishing should be great from here on out.